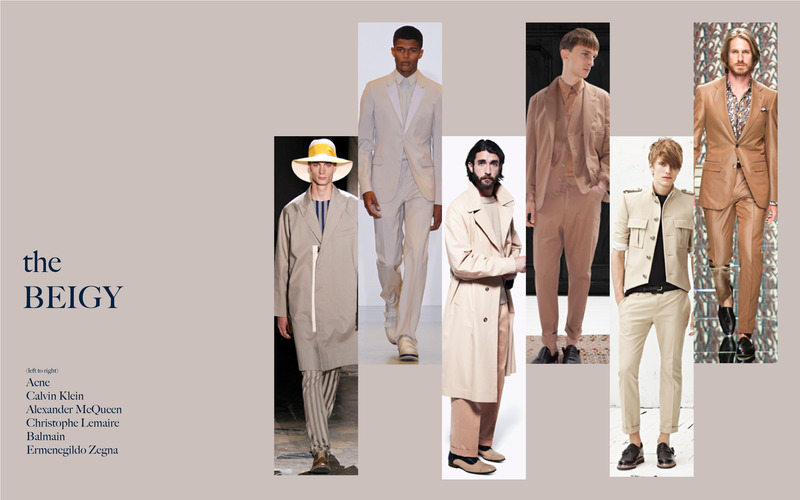 In spring summer 2013, we see that the casual dressing trend is going much further. Brands that always focus on classic elegance like Ferragamo and Valentino are dumping dress shoes for trainers. 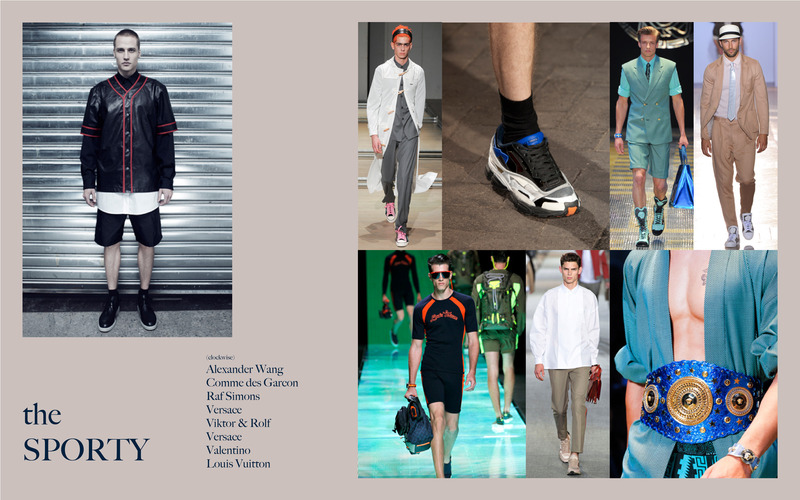 Alexander Wang and Versace are putting strong emphasis on sports theme. 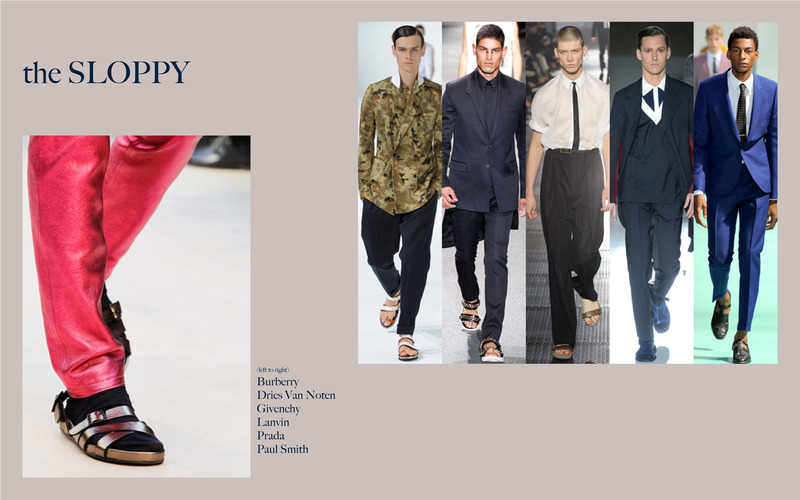 Prada and Burberry are steering the sandal-suits combination in this season. 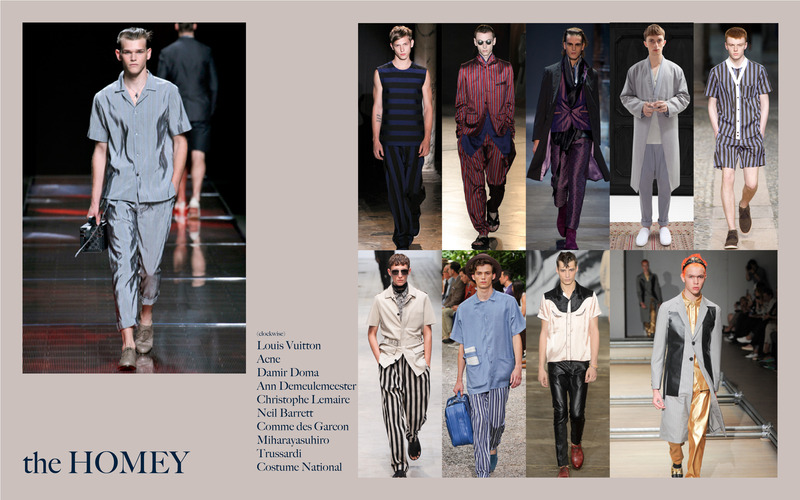 Even loungewear hits the runway with silky fabrics, vertical stripes and loose cut epitomizing the style. 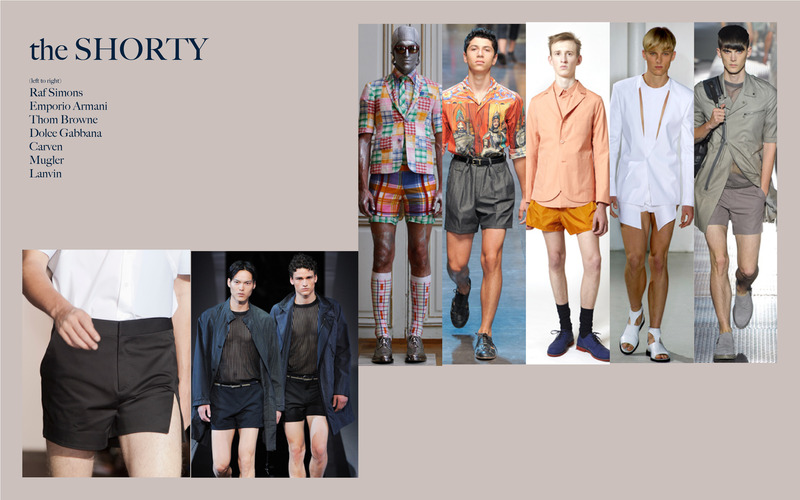 Shorts are going shorter this season to a mid-thigh length. Denim is making a revival after gone from fashion scene for a while. 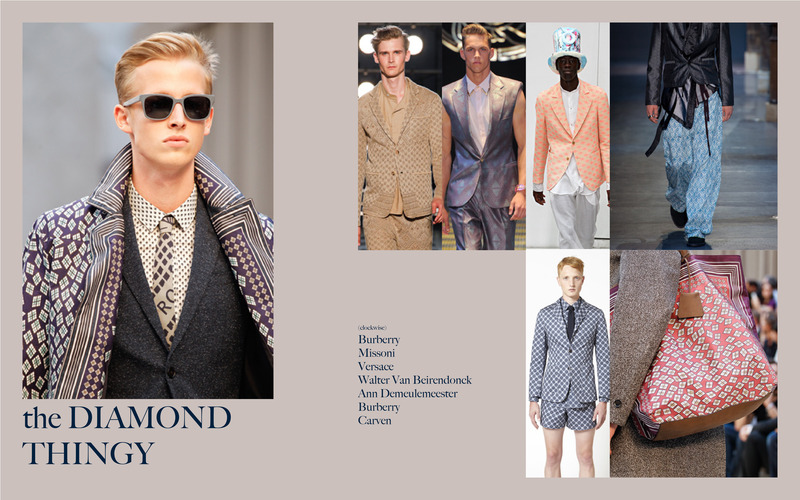 For print, we see an interesting tendency for using diamond-like shapes to form pattern. 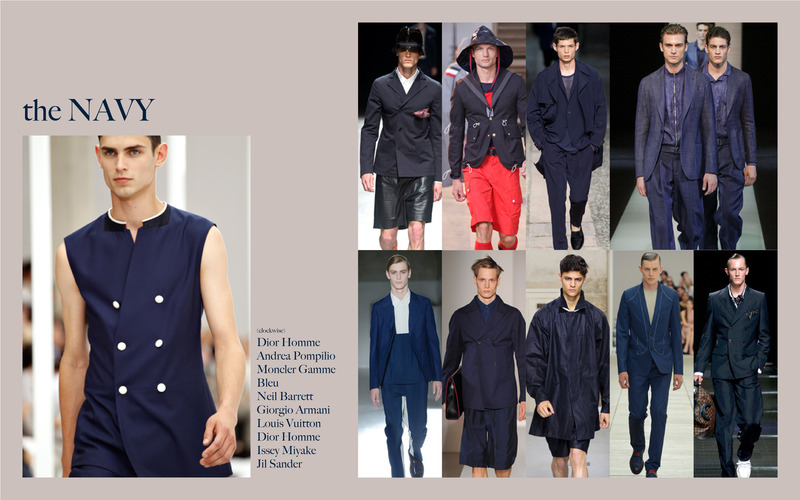 On the colour palette, it won’t be surprised that navy becomes mainstream after a military season in FW2012. Beige and white are also designer’s favourite choice. 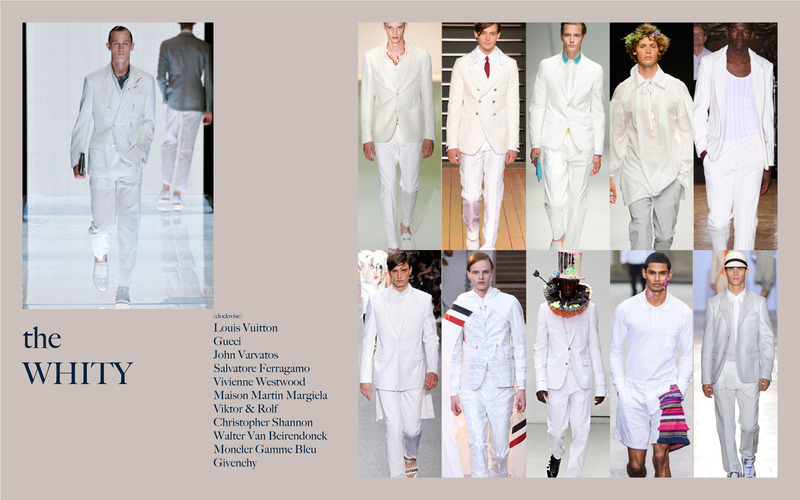 All-white outfit is already a key trend in womenswear of SS2012, and it is not likely to go away in the coming seasons. What’s the deal with those diamond thingy’s? I would love to see more of those. Seems like an interesting pattern/motif. Is it an offshoot of the plaid trend? I think menswear is getting more and more common with print. So designers are exploring different motifs. I think this trend is kind of a spin-off of the regularity of plaid to produce interesting print. Do you think Camo will strongly transition into SS13 – not only with solid navy – but with lighter hues of camo? This season fair isle had strong impact – how do you see that transitioning (in terms of pattern) into SS13? 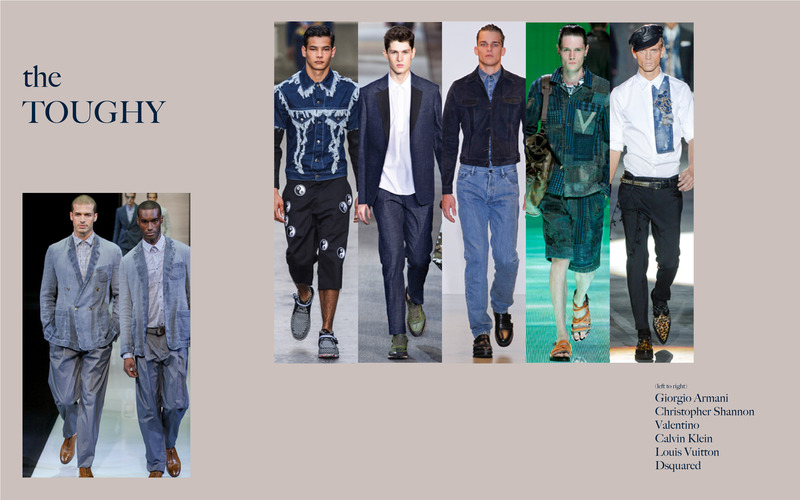 Do you think Camo will remain a strong menswear feature (not just in solid navy), but in lighter hues of camo for SS13? Fair Isle had a strong impact this season (FW12), how do you that transitioning (in terms of pattern influence) into SS13 for menswear? As far as I see, some brands are still doing camo in SS13, though won’t be as hot as in 2012. An interesting one in terms of colour would be Valentino, that they have a camo jacket with a bit of purple in it. And for the fair isle pattern, I think it’s always a more winter pattern, so it would be rare to translate it into summer clothes. But I think the “revival” of fair isle is partly because there is a tendency for men to go in more classic elegance look, but at the same time interpret it in a casual way – an example would be like the “sloppy” pairing as seen above.